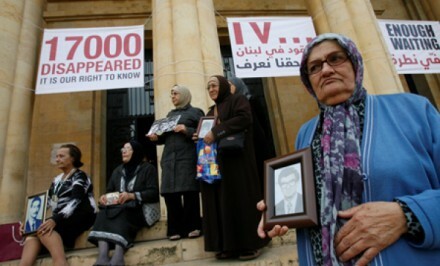 More than 17,000 people are believed to have disappeared as a result of the conflict in Lebanon between 1975 and 1990. The conflict included domestic, regional and international actors, which has complicated issues of responsibility and accountability. Peace in the country remains fragile, especially in light of the spillover effect from current regional instability. Although some legislative and administrative steps have been taken in order to assist families of the missing, a broad-based, government-supported legal and social strategy has not been implemented, which means that only a very small number of missing persons have been located and identified from the earlier conflict. Decades after a formal peace settlement was reached, the issue of the missing remains a serious obstacle to long-term peace, sustainability and progress. However, civil society has been persistent in keeping the missing persons issue in public view. NGOs have called on the authorities to launch a sustained and comprehensive process of accounting for the missing. The “Act for the Disappeared” NGO recently began publishing weekly first-person newspaper stories of the disappeared. The campaign accompanies the launch of a searchable interactive database of missing persons called “Fushat Amal” or Space of Hope. 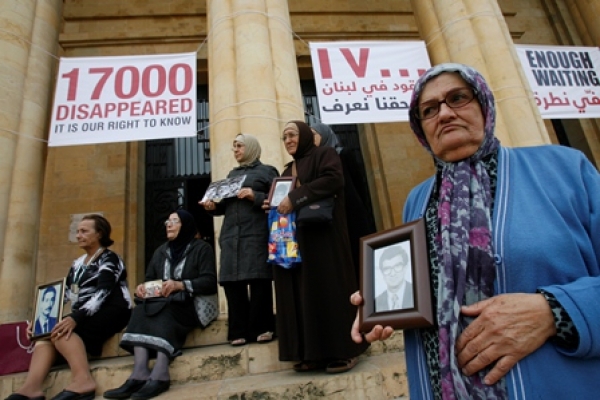 The International Centre for Transitional Justice (ICTJ) provides assistance and advice to civil society actors and policymakers working on Lebanon’s legacy of human rights violations, including enforced disappearances. In 2015, the ICTJ issued a report on the gendered perspective of the Lebanese missing, focusing on the wives of the disappeared. In January 2016, a report on the establishment of an Independent National Commission for the Missing and Forcibly Disappeared in Lebanon  was published, again by the ICTJ. The International Committee of the Red Cross (ICRC) is also involved in efforts to gather information about missing persons in Lebanon and their surviving family members. Since 2008, ICMP has taken part in activities related to addressing the issue of missing persons in Lebanon, through its cooperation with the ICTJ. ICMP has participated in meetings with civil society organizations, victims’ groups and decision makers in Beirut and has hosted study visits to its facilities in Bosnia and Herzegovina. In June 2010 ICMP hosted a visit to Bosnia and Herzegovina by Lebanese parliamentarians, government representatives, and civil society representatives under the auspices of the ICTJ and the Friedrich Ebert Stiftung. The purpose was to examine ICMP’s unique DNA-led process of identification, and to learn about the social and political steps taken in Bosnia and Herzegovina regarding identification of the missing. During the visit, Lebanese civil society representatives reiterated the need to address the issue of the missing in Lebanon in a serious and comprehensive manner, stressing the need for timely action since information is lost with the passage of time. Further initiatives have included a roundtable organized in November 2012 by the Beirut-based UMAM Documentation and Research, and the International Coalition of Sites of Conscience, bringing together NGOs from the Middle East and North Africa (MENA). The conference concluded with a resolution that the NGOs should form a MENA regional network to document human rights violations and work on memory projects that support transitional justice. The right to know and the right to truth are among the basic human rights that are violated by the crime of enforced disappearance. Families whose loved ones went missing at the beginning of the Lebanese conflict have waited more than four decades to know their fate. Four decades is a long time. Children of the disappeared have grown into adulthood. Many have never met their fathers. Wives of the missing exist in a social, emotional and legal limbo. They do not know where their husbands are; they cannot mourn; they do not have the support of a spouse; in many cases they are prevented by legal or social conventions from remarrying, while the status of being married and at the same time alone means that they cannot access their own or their children’s socio-economic rights. Those who attempt to move on with their lives risk societal pressure, criticism and even ostracism. In recent years, Lebanon has made some progress in tackling the issue. In 2014 the State Shura Council, the country’s highest administrative judicial authority, recognized “the right to know” in a high-profile decision. Draft legislation that would mandate the establishment of an independent national commission designed to uphold families’ right to know the fate of missing loved ones, is being discussed in parliament. The Consolidated Draft Law (CDL), which calls for the establishment of this commission, is under review by the Human Rights Parliamentary Committee. The mandate of the commission will be to investigate the fate of the missing and forcibly disappeared, to locate and exhume burial sites, and formally to identify missing persons and establish the circumstances of their enforced disappearance and death. This will require a broad legal mandate guaranteeing long-term administrative and financial independence and protection from interference. Lebanon signed the International Convention for the Protection of All Persons from Enforced Disappearances (ICCPED) in 2007 but has not yet ratified the Convention. The ICCPED is a legally binding instrument concluded under international law. It defines the crime of enforced disappearance and stipulates the obligations and responsibilities of signatory states in regard to resolving crimes of enforced disappearance. It comes into effect only upon ratification. Ratification of the ICCPED would send a strong signal of the country’s commitment to resolving the issue of enforced disappearance. The experience of other countries indicates that tackling the issue of persons who went missing during conflict is an essential element in transition. It is crucial that the authorities in Lebanon work with all stakeholders in order to enact effective legislation, establish viable and competent institutions, and provide political support for a successful effort to account for the missing. This is key to ensuring that today’s fragile peace is maintained.